Respiratory syncytial virus (RSV) invades host cells via a type I fusion (F) glycoprotein that undergoes dramatic structural rearrangements during the fusion process. Neutralizing monoclonal antibodies, such as 101F, palivizumab, and motavizumab, target two major antigenic sites on the RSV F glycoprotein. The structures of these sites as peptide complexes with motavizumab and 101F have been previously determined, but a structure for the trimeric RSV F glycoprotein ectodomain has remained elusive. To address this issue, we undertook structural and biophysical studies on stable ectodomain constructs. Here, we present the 2.8-Å crystal structure of the trimeric RSV F ectodomain in its postfusion conformation. The structure revealed that the 101F and motavizumab epitopes are present in the postfusion state and that their conformations are similar to those observed in the antibody-bound peptide structures. Both antibodies bound the postfusion F glycoprotein with high affinity in surface plasmon resonance experiments. Modeling of the antibodies bound to the F glycoprotein predicts that the 101F epitope is larger than the linear peptide and restricted to a single protomer in the trimer, whereas motavizumab likely contacts residues on two protomers, indicating a quaternary epitope. Mechanistically, these results suggest that 101F and motavizumab can bind to multiple conformations of the fusion glycoprotein and can neutralize late in the entry process. The structural preservation of neutralizing epitopes in the postfusion state suggests that this conformation can elicit neutralizing antibodies and serve as a useful vaccine antigen. 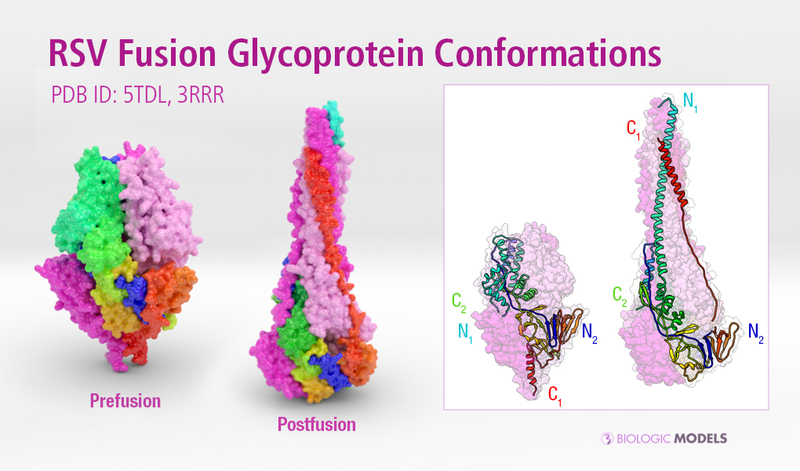 Use the interactive realtime 3D Biologic Explorer to visualize the internal anatomy and dynamic shape changes of the RSV Fusion Glycoprotein. (Best viewed in a full-screen desktop browser). 3D printed protein models of RSV Fusion F Glycoprotein visualize the conformational changes of this viral protein during membrane fusion. Each chain is colored uniquely, with one chain colored blue to red from N to C-Terminal. Using the interface below, configure the scale and materials using the horizontal slider and drop-down menu.